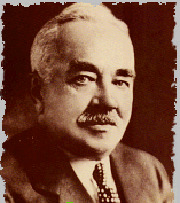 During the early 1900's, Milton Hershey (the "Chocolate King") made one of the great American fortunes. Born on September 13, 1857, near Derry Church, Pennsylvania, Hershey was raised as a Mennonite and attended school only through the fourth grade. 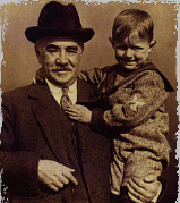 At the age of 15, he went to work as an apprentice to a confectioner, which is where his love of candy was born. After his own candy shop failed in 1892, he traveled to Denver, Colorado, where he found that superior results could be achieved when fresh milk was used in the caramel-making process. After several failed attempts to start his own businesses in Chicago, New Orleans and New York, Hershey finally returned to Lancaster in 1886 and created the Lancaster Caramel Company. After attending the Chicago International Exposition in 1893, Hershey became interested in producing chocolate as well. He bought German chocolate-making machinery and in early 1894, the Hershey Chocolate Company was born as a subsidiary to his caramel business. 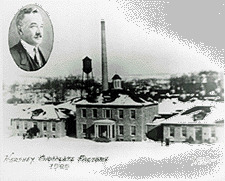 By 1905, he closed the Lancaster Caramel Company and moved the chocolate plant to Derry Church. In Derry Church, Hershey did not just create what is now the largest chocolate factory. He also recreated an entire town. After his factory was built, a bank, department store, park, church and much more were all built to keep up with the success of the company. Most importantly, Hershey and his wife Catherine established the Hershey Industrial School, which still provides an education for nearly 1,100 children from low-income homes. Hershey understood the importance of money, how it could be used to help those less fortunate. He also knew the value of hard work and determination. The "Chocolate King" did more than just produce wonderful candy: he cared about people and gave back to his community. The Milton Hershey School - This site provides detailed information about the single most important legacy of Milton and Catherine Hershey (after the Kiss? ).